Hey America, You're Roots Are Showing? | Who Do You Think You Are? "This splendid book makes genealogy come alive in the most vivid and compelling manner." - from the Foreword by Henry Louis Gates, Jr.
"Although I'm an experienced (self-taught) genealogist, I thought it would be fun to read a book designed for "newbies" to see if there's anything I could learn. The answer is a resounding "Yes." "When my preordered book arrived, it was probably one of the most anticipated books I had ordered in quite some time! Having been a fan of Megan's for a long time, I already knew it was going to be good. Megan takes us on a journey, in plain, simple language, and easy understanding, to find our ancestors. She fully explains the "tools of the trade" for someone who knows absolutely not one thing about genealogy, other than having a desire to trace their family history. But she does it in such a way that those of us who have been doing just such research for many years, finds it a pleasant recall and entertaining! Never is it boring, stuffy or redundant. In nine, easy-to-read chapters, Megan takes us through preparing for the search; using the Internet to assist us in our search; how to utilize the census records; using vital records [birth, marriage and death]; military records; performing research in other countries; and passing on our research through sharing. See what Kevin Kelly, co-founder of Wired, has to say about Trace Your Roots with DNA. See what fellow readers have to say about Trace Your Roots with DNA at Amazon. Columnist James M. Beidler's remarks on Trace Your Roots with DNA: "Trace Your Roots with DNA makes what can be a complicated dose of science into simple and example-filled reading. In actuality, the book is appropriate for both genealogical beginners -- the primer chapter of family history basics is as clear as the other parts of the book -- as well as those who merely want to get up to speed with the impact of DNA on genealogy." "Trace Your Roots" is more than a first-rate 'how to' book'—it is a fascinating look at the history, importance, and future of genealogical DNA testing. Those who are new to the subject will learn everything they want to know, and professional genealogists will find a treasure trove of new information. This is a sensational book!" "Finally, a book on DNA from a genealogist's perspective. Trace Your Roots with DNA is very light and lively reading, and it explores the many surprising uses of genetic testing for roots-tracing. 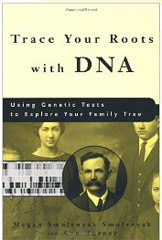 If you want to understand how to use DNA for genealogy, this is the book for you." "Inviting and informative, this work presents an easily understood, yet wonderfully detailed explanation of a complex subject. From the well-written text and valuable sidebars to the excellent overall layout and presentation, Trace Your Roots with DNA is a significant contribution to the understanding of genetic testing in the context of genealogical endeavors. As interest in DNA testing for family heritage purposes continues to grow, the Smolenyak and Turner work will be essential to a complete understanding." "Genetic typing is the newest tool for amateur genealogists, and it's enthusiastically espoused by the experienced authors of this useful guidebook (Smolenyak is the lead researcher for PBS's Ancestors and the author of In Search of Our Past Ancestors; Turner contributes to the GENEALOGY-DNA mailing list). How does it work? By tracing one's "DNA heirlooms," the two forms of DNA that are passed on in a family from generation to generation. These "heirlooms" include genetic markers on the Y chromosome, passed on by fathers, and mitochondrial DNA, passed on by mothers. If it sounds hard to understand and do, the authors reassuringly offer clear explanations of the science and how to use it. DNA typing can tell you if you're related to someone with the same surname, pinpoint a certain ancestor and verify your other research. But, as the authors warn, it could also prove your previous assumptions wrong or uncover unwanted information, such as that a family member was adopted. 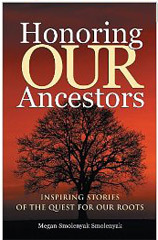 If you have been researching your family's history and have unanswered questions, this enlightening book may offer some answers; at the very least, it will walk you through the benefits and drawbacks of DNA testing." -- Copyright © Reed Business Information, a division of Reed Elsevier Inc. All rights reserved. "Threads from so many wonderful stories are woven together here in a way that celebrates history, heritage, family, remembering, and recreating. In these pages one will find countless ties that link generations across time and continents. It's not only a book one will find hard to put down, it's a book one will find hard to read just once." "What a sensational book! Megan has discovered some of the most amazing stories I have ever read, and she tells them with great passion, humor, and respect. Every family in America should have this book." 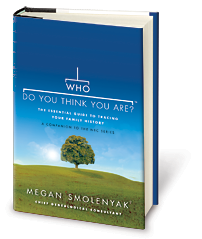 "Megan Smolenyak Smolenyak (besides having the coolest name I've ever heard) is the guru, the pope, the beginning, the middle and the end of genealogy. And like all good gurus, she inspires the rest of us to find our own roots, to keep digging until we know our own story. This book is an important book for anyone who has ever had a mother, a grandmother or a great-grandmother. Make it part of your library now." "I won't try to tell you why your personal heritage is important. Read this book and you'll understand." 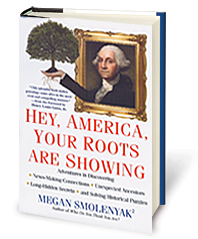 "In Honoring Our Ancestors, Megan Smolenyak Smolenyak beautifully captures the significance of remembering our roots. You'll want to get out your heirloom scrapbooks and artifacts to discover your legacy, or create a new tradition in your family. Connect with your history; give yourself the gift of your past with this book. One of the great shortcomings of America is that we idolize youth and minimize the value of the precious insight, intuition and wisdom our elders have to offer. The stories Megan shares in Honoring Our Ancestors give me hope that more of us are waking up to all we have to gain by paying attention and tribute to our forebears. By looking to the past, we can craft a better future. "This collection of stories is sure to inspire readers in exploring the branches of their own family trees"
"Some of the stories are absolutely amazing, and I plan to keep this book around for those times when I feel I am spinning my wheels! It is a guaranteed pick-me-up." "The book is heartwarming to read even for nongenealogists." 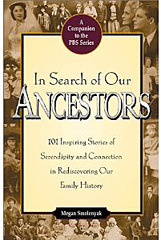 "My granddaughter gave me a copy of In Search of Our Ancestors for Mother's Day. I read each story and just could not put the book down until I had read them all!" "Megan's book is akin to eating sherbet as a mid-meal course to 'cleanse the palate.' After heavy servings of dry books, microfilm screens, and deciphering old handwriting and even older land records, In Search of Our Ancestors brings variety to the genealogist's usual reference fare and lifts the researcher's spirits"
"nominated for a Virginia Literary Award"
"A delightful volume of personal stories about why people do genealogy, and their experiences of climbing their family tree . . . you'll enjoy this book." "Other than the Bible, I don't think I have had a book impact my life quite like Megan Smolenyak Smolenyak's In Search of Our Ancestors." "...this collection is designed to simply share the warmth and surprises that genealogical research can bring if you stick with the hunt, keep your sense of humor, and listen to your heart." "My husband read the whole book that afternoon!" "The growing popularity of family genealogy is a true cultural phenomenon. More than just a hobby, it is becoming a new American enterprise, with families at its core. While the Internet has made historic records more accessible than ever, the sheer number of websites and resources can be overwhelming to the beginner. 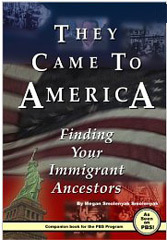 They Came to America provides a valuable 'how-to' guide for taking the steps to bringing your own personal family tree to life - connecting the past with the present for future generations." -- Stephen A. Briganti, President and CEO, The Statue of Liberty-Ellis Island Foundation, Inc.